In depth information about the headlight renewal service offered by Moyer’s Mobile Detailing. 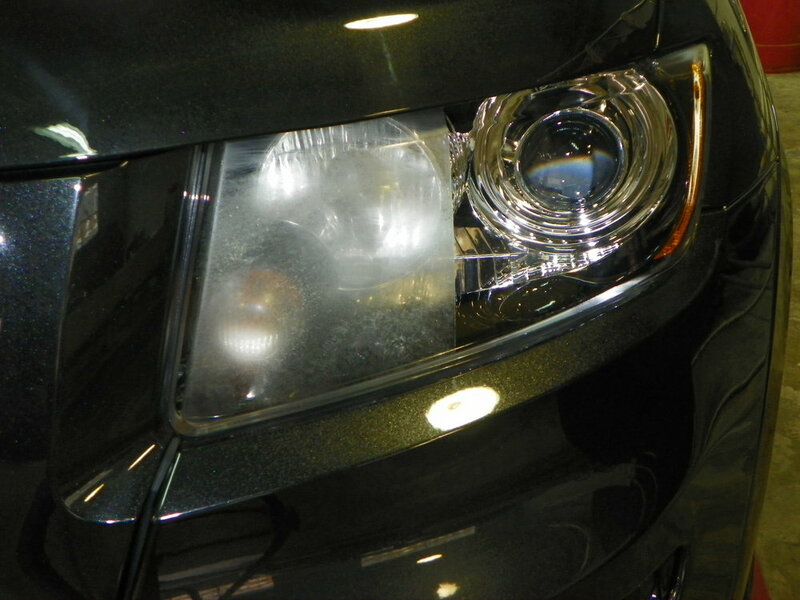 Often overlooked, faded or cloudy headlights can be corrected fairly quickly. The difference in light output will amaze you so much you'll wonder why you didn't have your headlights restored sooner. don’t put yourself and everybody around you in danger! One of the most unattractive things about a car can be foggy or hazy headlights; it doesn't matter how clean the car is, it still looks run-down and old. Besides the visual and cosmetic aspect of having oxidized headlights, its a hazard to your safety. When you're driving at night with headlights that need to be restored, the distance your headlamps project onto the road in front of you is reduced and puts you at risk of being in a car accident. This also jeopardizes the safety of other drivers on the road due to not seeing you, or you not seeing them. What causes your headlights to become cloudy? Why can't I just buy the do-it-yourself kit at my Local Auto Parts Store or Super Center? I always encourage customers to refrain from buying the cheap kits you see at auto parts store and other super centers. These products are a very short-term, temporary fix that will last maybe a few short months (I have had customers who used them and said in a few weeks they were fogging up again). These kits do not get to the root of the problem, it's only a band-aid. With anything in life, I like to say that you get what you pay for. How is my process different? My process is a multi-stage correction that involves sanding/removal of all oxidation, corrosion, and dead plastic on the exterior surface of the headlight lens. Unlike store-bought kits that you "wipe" new, I remove and prep the surface prior to sealing the lens. Upon completing the lens restoration, I coat them with a glass coating that bonds to the plastic to bring out more clarity and to protect the lens from corrosion, oxidation, UV damage and ultimate failure.